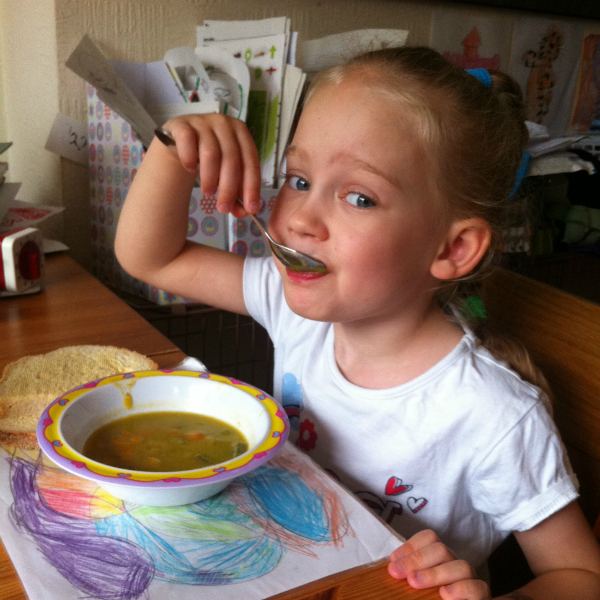 For several days now Jasmine has been asking me if she can have soup for lunch, soup with vegetables in. I know she actually meant Heinz Vegetable Soup but as we had rather a lot of peas and some carrots left over from our PYO trip to Garsons Farm I decided it would be much nicer to make our own. Yesterday morning we spent a long time shelling all the peas and I made Pea Soup with half of them. In the afternoon we went shopping and bought some green beans and broccoli and then this morning, with Gordon around to play with Ben, Jasmine and I (with a little help from Thomas) made our own vegetable soup. I got all the ingredients together and put everything on the table with a chopping board, a knife, a vegetable peeler and several bowls. Jasmine started by chopping the green beans into small pieces and placed them in a bowl. She pulled some “small trees” off the broccoli and these went in another bowl. I peeled a couple of potatoes (I wasn’t brave enough to let her do this!) and she chopped them into cubes. Lastly, she got to use the peeler and she peeled and chopped the carrots. Thomas appeared while we were doing the carrots so he had a turn peeling and chopping as well. 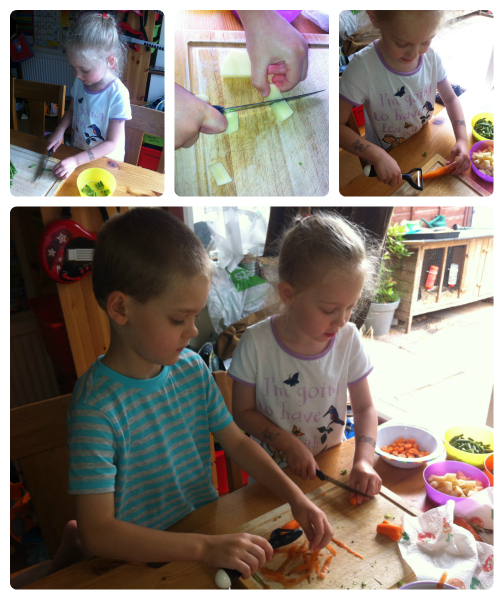 They both really enjoyed preparing the vegetables and were really sensible with both the knife and peeler. This is what has always worried me about letting them prep veg because they do have a tendency to become a little silly as kids do! When I am on my own with all 3 kids I know I would find an activity like this very stressful, but today with Ben distracted and both Jasmine and Thomas really keen I was so impressed with them. Jasmine told me that chopping the veg with a knife was just like using the saw at Forest School! She also said a couple of times how much she enjoyed “learning how to chop things because when I have my own house when I am bigger I need to know”!!! Once everything was prepared I put it all in a pan with about half of the remaining peas from yesterday, a couple of handfuls of small pasta bows and a jug of vegetable stock. I simmered this over a low heat for around 40 minutes. I then ladled out about half of the soup into a bowl and blended this until it was smooth. I added the blended soup back into the pan and mixed it well, to give a lovely final soup with vegetables in, just as requested. I knew the biggest test would be when it came to eating it for lunch. Jasmine usually doesn’t like mixing her foods and everything on her plate has to be separate, so I was a little concerned that even though she had helped plan and prepare the soup, she wouldn’t actually eat it! She well and truly proved me wrong though and she loved it! Ben took a while to start, but eventually he ate his. Thomas had pea soup and he enjoyed this as well! And my opinion.. it is delicious and I think we did a good job!